This PDF 1.3 document has been generated by Word / Mac OS X 10.10.4 Quartz PDFContext, and has been sent on pdf-archive.com on 21/10/2015 at 22:04, from IP address 70.29.x.x. The current document download page has been viewed 304 times. 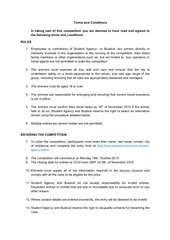 operators or travel agents are not permitted to enter the competition. group, including ensuring that all risks are appropriately assessed and managed. 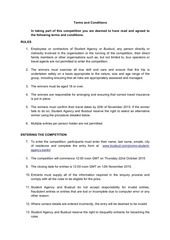 The winners must be aged 18 or over. insurance is put in place. alternative winner using the procedure detailed below. The trip must take place between 1 December 2015 and 31 January 2016. Multiple entries per person holder are not permitted. 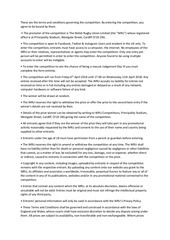 comply with all the rules to be eligible for the prize. Where contact details are entered incorrectly, the entry will be deemed to be invalid. and Conditions and agree to be bound by them. on availability and third party consent. Stadstoelen, or Stayokay Amsterdam Zeeburg. twin room with breakfast included. 2 Rives hostel in Strasbourg, in a shared room including breakfast. Transport, local taxes and membership card are not included. hostel for the winner’s selected hostel. any of its associated parties. Brussels, from Brussels to Strasbourg, and from Strasbourg to Vienna. transportation for the winner’s selected bus tickets. Busbud or any of its associated parties. There will be 1 prize winner selected, who must be one of the two people travelling. to travel, and is subject to availability. 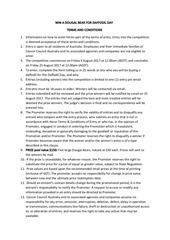 The prize cannot be used in conjunction with any other promotional offers. The draw will take place on Friday 13 November 2015. The winner will be notified by email within 3 days after the draw. alternative winner from the list of entries. The name and regional location of the winner will be published via social media. The winner may be required to participate in post-­event publicity. Federation, operating as Hostelling International. 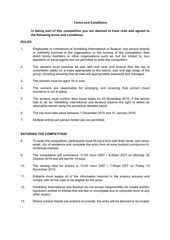 All entries will become the property of Hostelling International and Busbud. misrepresentation, as a result of its negligence. without permission, except for the purpose of administering the competition. information for future promotional, marketing and publicity purposes. extend the competition at any stage, with or without notice, if deemed necessary. markets. Any entries submitted prior to this will remain valid. 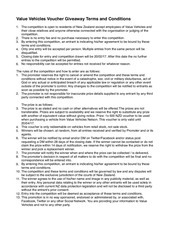 The competition and these terms and conditions will be governed by Canadian law. Entrants submit to the exclusive jurisdiction of the Canadian courts. This file has been shared by a user of PDF Archive. Document ID: 00309662.